Carpenters Mate supplies premium-quality deck screws known for their strength, reliability, corrosion-resistant properties and efficient application. Each of our screws has been designed and tested by the trade, using high-quality materials to ensure reliability and durability. 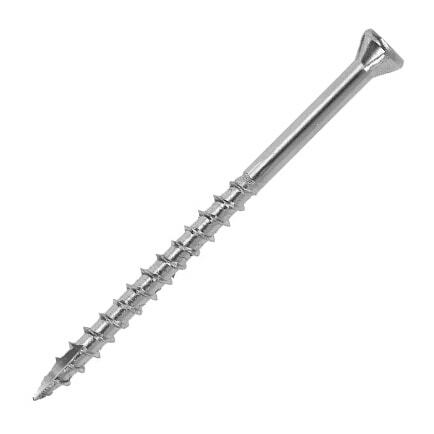 Our finishing screw is manufactured from 316-grade stainless steel which has a higher % of titanium for greater resistance against corrosion and strength-perfect for decking projects or any other outdoor timber projects that require a discreet yet effective finishing screw. Whats more, our finishing screws feature a multi-purpose trim head that can be powder-coated to match the colour of your decking, for a seamless, unobtrusive, near-invisible finish. Browse our range of finishing screws. You can filter products here. Are made from stainless steel which is highly compatible with saltwater areas due to strong corrosion-resistant properties. Feature a 6mm head diameter for a nearly invisible fastening. Require no predrilling - our self-drilling finishing screws allow you to complete decking projects faster and more efficiently than ever before. Come with a free drive tool in each box. Feature a type 17 point for fast drilling. Is a No.7 gauge screw. Carpenters Mate by OSC Sales is the UK’s original self-drilling wood screw brand. We’re renowned for offering premium-quality, self-drilling screws that are effective, efficient and reliable. Each of our screws has not only been designed, tried and tested by the trade, so you can rest assured your Carpenters Mate screw will work for the longevity of your project. Still not convinced? Request a free sample our self-drilling finishing screws today. Simply fill out a form online or get in touch by calling us on 0845 241 9862 to receive your free sample. If you’re looking to buy a single pack or multi-pack of our finishing screws from your local retailer, you can find a distributor near you here.